We just returned from a wonderful trip to Kiawah! 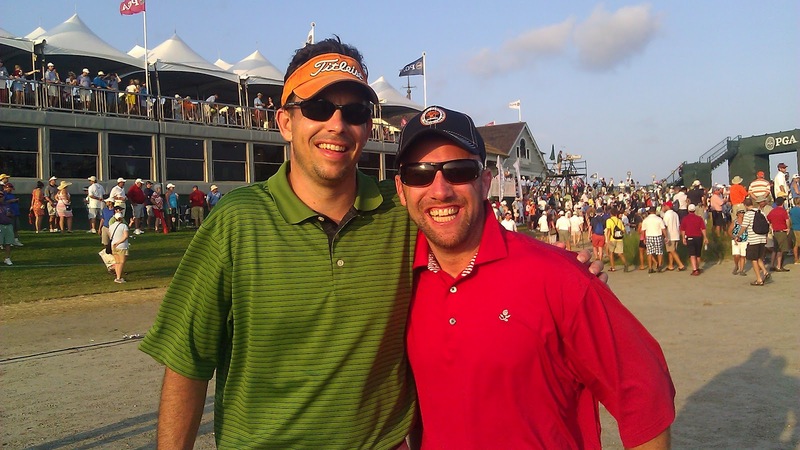 For Greg's birthday, I bought him 4 tickets to the PGA, which was at the Ocean Course on Kiawah Island. We had tickets for Friday and Sunday, so we headed down on Wednesday night and met Greg's best friend from high school Andrew and Betsy. We had the best time! I have to say that Noni went above and beyond her call of duty!! She took care of the boys and I had a relaxing 4 days and enjoyed the tournament. Beckett actually slept in her room and for whatever reason, Jackson decided to sleep in every day so every morning, when Jackson and I would roll out of bed around 8:30, Noni had already fed Beckett his bottle, breakfast, and had put him down for his morning nap. I can't remember the last time I was able to sleep in that late!!! She also took care of the boys while we went to the tournament and while we enjoyed an evening in downtown Charleston. She really is the best Noni ever!!! The boys had so much fun with Noni and Grandday and can't wait to the next trip. Thank you Noni and Grandaddy for an amazing trip! Greg and Andrew. They have been best friends for a long time!!! This was my first major tournament and it could not have been more perfect! It was a little windy the first day, but the last day, we had a perfect spot on the 17th hole and saw a lot of famous golfers. Tiger Woods actually walked right past us!! After McIlroy finished on 17, we headed to the 18th hole to rush the green. Andrew and I sprinted and made it to the front row! We got so close to them!!! We really had the best time!! At the end of the tournament, we happened to walk past the kid who was carrying the leader board and he was kind enough to pose for a picture with us! What an amazing tournament and we couldn't have spent it with 2 better friends! It was definately a trip we will always remember and cherish!!! Thanks again Noni and Granddaddy for being the best hosts ever!! The days that we weren't at the tournament, we spent at the beach and pool. Jackson loves to build sand castles. He loved to try to pile the sand up as high as possible! He also loves to play beach ball. Daddy will throw the ball into the waves and Jackson tries to stop it before it reaches the shore. Best Noni ever!! Jackson and Beckett are so lucky to have such a loving Noni! They love her so much!!! Getting the bikes ready to caravan to the beach. Jackson did great again riding his bike all the way to the beach. Jackson also loves to play football! We actually signed him up for flag football at our church and he starts the end of September. This will be his first introduction to organized sports, so we will see how it goes! When we went downtown, we stopped at the Charleston candy shop to pick up a little treat for Jackson I found some rock candy, which I used to love as a child. It seems Jackson loved it as much as I did! One of Noni's many projects to keep Jackson entertained. A Super J cape for my little superhero! Super J! Thanks again Noni and Grandaddy for an amazing trip! We can't wait for the next visit. We love you! !